The Ford C-Max Hybrid: An Ideal Taxi? While I’ve seen plenty of Prius taxis in New York City, they always seem to be greatly outnumbered by the traditional Ford Crown Victoria. Landing on the other coast last month proved to be an eye opener. I was taken aback by the sheer number of Toyota Prius taxis gliding about the streets of San Francisco. They were everywhere. Now I’ve never thought of the Prius to be well suited to taxi work from a passengers standpoint, but it’s easy to see the appeal from the fleet owner’s perspective. It comes down to dollars and cents. The drastic improvement in fuel economy between a gigantic sedan with a V8 engine and a (relatively) smaller and lighter vehicle with a hybrid drive train is undeniable. While a taxi fleet manager’s is concerned about overall costs, passengers are concerned about their personal comfort and perceived safety. Think back for a moment … have you ever passed up a smaller cab for a larger one? When comparing the original Toyota Prius to the Prius V (its larger brother) and the Ford C-Max, the original wins on gas mileage, but loses on passenger and cargo room. Larger passengers will appreciate the significantly more generous proportions of the Prius V and C-Max. The C-Max offers more room than the Prius V, topping the charts in leg room, hip room, head room, and overall passenger volume. The Prius V is tied with the C-Max on shoulder room and holds a considerable advantage when it comes to cargo room. The C-Max is significantly more fuel efficient than the Prius V, however, with a three mile per gallon advantage in the city and a seven mile per gallon advantage on the highway. Justifying the purchase of a hybrid taxi isn’t tough when you do the calculations. We’ll use some round numbers to make things easy. Lets assume that the price of gasoline is $4 per gallon and that the lifetime of the vehicle is 200,000 miles (which is fairly conservative for the old Crown Vics). If an idle-heavy Crown Vic gets 12 miles per gallon, the cost per mile is approximate 33.3 cents, for a total 200K mile fuel cost of $66,600. (Yes, the devil is in the details.) If an (automatic start/stop) Hybrid averages 48 miles per gallon, the cost per mile is approximately 8.3 cents, for a total 200K mile fuel cost of $16,600. Is there a reason we tweaked the numbers a wee bit? Of course there is … 50,000 of them, to be exact. Jumping from a 12 MPG vehicle to a 48 MPG vehicle yields a 25 cent per mile saving. Needless to say, all of those quarters add up. Over the course of 200,000 miles, they account to a whopping $50,000 in savings at the pump. Acquisition and maintenance costs are a factor, no doubt about that. Many taxi cars enter the fleet after their first lives as police cars are over. They may be acquired from government auctions at reasonable rates. They’re easy to fix and were built to take abuse. But they have no warranty. With the Ford C-Max, the power train carries a five year / 60,000 mile warranty, and the “Unique Hybrid Components” are covered for eight years or 100,000 miles. If the fleet owner chose to sell at 99,999 miles, they’d only save a measly $25,000 or so in fuel over the course of that time. U.S. Diesel Policy: Taxation Without Representation? Whoa! Hold on, does a Crown Vic that driven NYC taxi style realistically get that terrible gas mileage? yikes, replace all those Sandy-ruined cabs with Prius Vs and C-Max’s! The Ford CMax Hybrid only gets 37 mpg. It loses out to the Prius and Prius V. Plus it doesn’t have Toyota’s 13 year history with Hybrids and reliability. @Jameskatt – There is no winning and losing. Toyota’s hybrid technology is wonderful, but having spent time with both the Prius and C-MAX, the Prius falls short in terms of ride, handling, and performance. 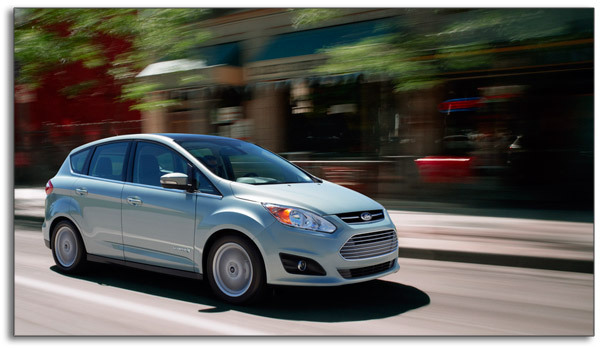 The C-MAX is capable of more than 37 MPG in stop-and-go traffic. (I’ve done it … check my detailed driving log.) With regard to history, Ford released their first hybrid in 2004. Bottom line? Buy the most fuel efficient car that meets your needs and makes you happy. 🙂 It’s all good!